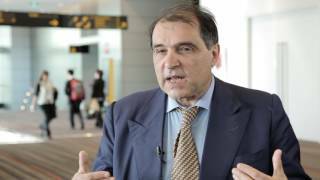 Giovanni Rosti, MD of Ospedale Generale, Treviso, Italy highlights key discussion points from MASCC 2016. New drugs help to reduce vomiting, but patients still experience nausea. Two things are needed to address this problem. First, a way to measure nausea in a dynamic way. Second, new drugs to treat nausea. Dr Rosti mentions that medical oncologists should have a broader view and aim to help patients experiencing side effects like pain. There is a need to abolish the barriers, e.g. a lack of opioid treatment in some countries, and increase the understanding of supportive care treatments, which to patients are as important as their cancer treatment. Recorded at the Multinational Association of Supportive Care in Cancer (MASCC) and International Society of Ocular Oncology (ISOO) 2016 Annual Meeting on Supportive Care in Cancer held in Adelaide, Australia.